TOPEKA, KANSAS (The Nil Admirari) - Earlier today Kansas Governor Sam Brownback signed legislation that will only grant welfare benefits from the Temporary Assistance for Needy Families (TANF) program to unregistered gun owners, registered Republicans, and/or those who live in a region of the state where their tap water catches on fire. The move is the second stab at the poor and most vulnerable members of Kansas society in a week. On April 16th, Brownback signed HB 2258, which solved the rampant problem of TANF recipients spending welfare money at swimming pools, lingerie stores, tattoo parlors, movie theaters, casinos, cruise ships, psychic shops, and massage parlors instead of using the funds to buy essentials like food. "I don't know how these takers can go without eating food and spend their money on luxuries like tattoos and massages, but we don't have to worry about that anymore," stated Brownback after he signed the bill. A smirk developed on his face as he continued, "This will definitely solve the problem of homelessness and child poverty being at record levels in Kansas, and pave the way for more tax breaks for the deserving job creators. I'm sure that won't worsen the massive state deficit." At today's signing Brownback was in a similarly upbeat mood as he kicked thousands off of TANF rolls. "Limiting welfare benefits to unregistered gun owners, registered Republicans, and/or those who have tap water in their home that catches fire ensures only freedom loving Americans will get government assistance," explained the governor. 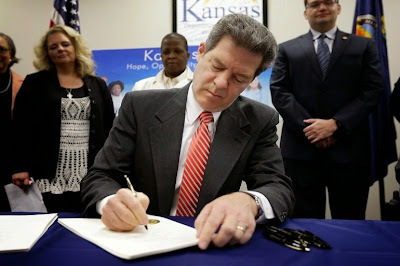 Brownback's face lit up as he signed legislation giving thousands of his state's citizens the freedom to live on the streets. "This bill also rewards those who likely voted for me because they know how much I have done to support the rich having even more freedom to exploit and destroy our great state's natural resources." Brownback hinted at even more stringent limitations on who could qualify for TANF. "I am working with legislators to see if we can't require citizens whose tap water can catch on fire to also be in an earthquake prone region of Kansas if they are going to get welfare benefits. Otherwise, do they really need TANF?" Early drafts of the new welfare bill being spawned in Topeka confirm the state legislature is on the same page as Brownback. The bill would require a Kansas resident applying for TANF to sign a document stating he or she "knows the increased rate of earthquakes (and water that burns) in my area of Kansas has nothing to do with fracking. So I will shut up about it already and sign this document forfeiting my right to sue the state and fracking companies for damages." Neighboring Oklahoma is considering similar welfare legislation due the state recently becoming the most seismically active area in the country. It is largely believed by many incorruptible politicians in that state to be a coincidence the increased seismic activity began shortly after fracking operations.